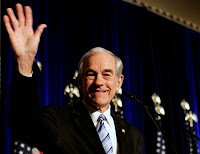 Republican presidential hopeful, Rep. Ron Paul, waves during a speech to the Conservative Political Action Conference on Thursday, Feb. 7, 2008, in Washington. Ron Paul bowed out of the Republican presidential race today and ruled out running as a third party candidate. Whoa! What a year this has been. And what achievements we have had. If I may quote Trotsky of all people, this Revolution is permanent. It will not end at the Republican convention. It will not end in November. It will not end until we have won the great battle on which we have embarked. Not because of me, but because of you. Millions of Americans — and friends in many other countries — have dedicated themselves to the principles of liberty: to free enterprise, limited government, sound money, no income tax, and peace. We will not falter so long as there is one restriction on our persons, our property, our civil liberties. How much I owe you. I can never possibly repay your generous donations, hard work, whole-hearted dedication and love of freedom. How blessed I am to be associated with you. Carol, of course, sends her love as well. In the presidential race and the congressional race, I need your support, as always. And I have plans to continue fighting for our ideas in politics and education that I will share with you when I can, for I will need you at my side. In the meantime, onward and upward! The neocons, the warmongers, the socialists, the advocates of inflation will be hearing much from you and me.